For every house Puja ghar is the main place where one can feel peace and warmth of your almighty that’s why Aarsun Woods bring to you the handmade wooden Temple made up of Teak Wood in Traditional Finish. The temple is mounted on curved piers and above that there is single drawer at the front with brass knob for placing some puja essentials. Above that there is main place for the deity where you can place your idols and there are carved pillars at the front of the temple.Rising to the roof there are beautiful bells hanging on the upper sides of the roof and at the roof top there is gopuram style dome placed along with three shikhara at the top. There is beautiful mehraab area at the front in which floral carving done by our skilled artisans. The temple is made up of Teak wood and beautifully carved by our skilled artisans and best suitable for the home and offices. As we are the manufacturers so customization are available as per the customer requirement. Please note that the back, the base where idols are to be placed and in the inner portions of the temple is made from teak plywood. 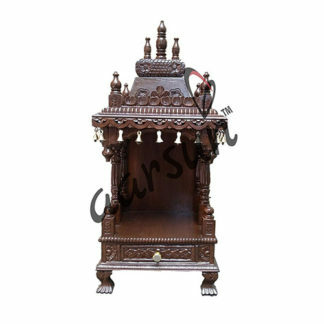 There are a number of designs available in Wooden Teak Wood Temple, we suggest you to have a look at Teak Wood Temple , also at Home Mandir / Prayer Unit. In case you are looking for Sheesham / Rosewood Temple , Designer Wooden Temple, also at Sheesham Wood Temple / Mandir by Aarsun.